The construction site of 55,000-capacity stadium in southern Poland has been abandoned since June 2013. Recent weeks saw previous contractors negotiate terms of finishing the halted work. As talks fell through, new tender will be announced soon. Stadion Śląski is Poland’s largest stadium under construction and second largest planned overall. But for almost three years the construction site has seen very little work after a serious accident took place in 2011. During the roof’s ‘big lift’ operation, cable connectors broke, suggesting durability problems. Several independent reports finally gave the answer: German engineers didn’t design the roof strong enough to withstand regular use. It took well over 2 years to deal with the problem, which was the first of its kind worldwide. 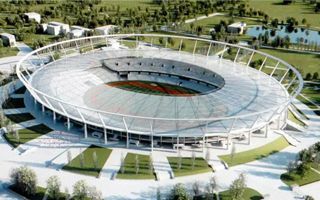 In June last year Mostostal Zabrze and Hochtief, the two general contractors, left the stadium’s construction site. Their involvement was generating losses without any work to carry out. Now both the contractors and investor, the Silesian region, seek compensations from one another for the standstill. Recent months saw the two sides halt all court proceedings against each other. With a new, modified roof design and all construction permits in place, the project may go under construction again. This is why Mostostal Zabrze and the Silesian region were negotiating conditions of continuing cooperation on the project. Should they reach an agreement, work could be relaunched almost instantly. Yesterday it was confirmed by both sides that no compromise was reached. This means Silesia need to announce a new tender and hope that potential contractors offer a construction budget within the financial capabilities. Money is why it didn’t work out with the previous company. Mostostal wanted PLN 210 million for finishing the stadium, while Silesia have only 170 million.